Photo stories is about our own or borrowed pictures with a telling story illustrating territorial justice and cohesion – or lack thereof. Guest photo stories are most welcome! The cover photo of this website is taken at the Canal in downtown Brussels, Belgium. The photo is taken on a frosty January morning during an excursion organized by ISOCARP and the Brussels Capital Regional Planning Agency. We are here on the side of Molenbeek, the municipality that became internationally infamous as the residence of terror suspects of the Brussels airport and metro blasts in March 2016. Molenbeek was always very segregated from ‘the other side’ of the canal that runs as a linear barrier through the western part of the city. 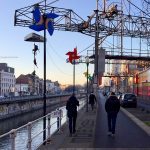 The Brussels Region-led Canal-Plan aims at enabling more territorial cohesion across this physical barrier, by tapping into the territorial capital of the abandoned industries on the Molenbeek side. The Canal-Plan further aspires to reconnect Brussels City with its sea-port, with the Canal as connective structure. In 2016, ISOCARP’s international jury has awarded the 1st Grand Prize for Excellence in Urban Planning to the Brussels-Capital Region for its Canal Plan. For more, here.